For people of faith, storytelling has special meaning. We are people of the story, and we seek to identify and share our stories in nearly everything we do. 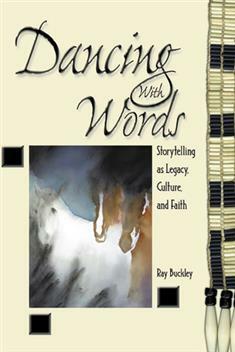 Dancing with Words provides help for all church leaders — both clergy and lay — to explore the history and importance of storytelling in faith development and to acquire basic storytelling skills. You will soon discover ways that storytelling enhances ministry. Storytelling at its best is an interaction between storyteller and story listener. It is a relationship between the speaker and the listener that may best be described not as a "telling" but as sharing — storysharing. The vehicle is the story, but the experience can be as engaging as an intimate conversation. Tell Stories Leader's Guide is also available.